Author: Smith, Martin Cruz Set In . . . 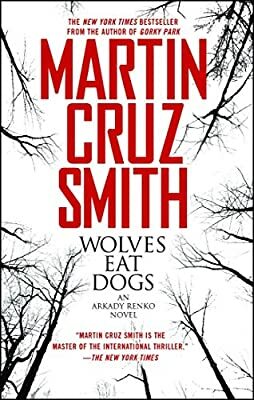 Description: A Moscow detective is sent to Chernobyl for a frightening case in the most spectacular entry yet in Martin Cruz Smith’s Arkady Renko series. In his groundbreaking Gorky Park, Martin Cruz Smith created an iconic detective of contemporary fiction. Quietly subversive, brilliantly analytical, and haunted by melancholy, Arkady Renko survived, barely, the journey from the Soviet Union to the New Russia, only to find his transformed nation just as obsessed with corruption and brutality as was the old Communist dictatorship. In Wolves Eat Dogs, Renko returns for his most enigmatic and baffling case yet: the death of one of Russia’s new billionaires, which leads him to Chernobyl and the Zone of Exclusion—closed to the world since 1986’s nuclear disaster. It is still aglow with radioactivity, now inhabited only by the militia, shady scavengers, a few reckless scientists, and some elderly peasants who refuse to relocate. Renko’s journey to this ghostly netherworld, the crimes he uncovers there, and the secrets they reveal about the New Russia make for an unforgettable adventure.